These days, visit New York, Los Angeles, or San Francisco, and you can easily eat your way through those cities without ever entering a restaurant. 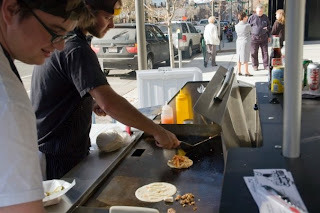 Street carts are providing upscale eats (entrees to desserts) from refurbished trucks and simple curb-side griddles. Los Angeles residents enjoy open-air Korean barbecue, and New Yorkers drop by the Dessert Truck for slow-baked apples and warm chocolate bread pudding. But while gourmet street eats have boomed elsewhere, Denver has stayed relatively quiet. Until now. About a month ago, Mike Winston and Bryan Hume, former cooks at Table 6, opened Gastrocart on the corners of 18th and Curtis streets in Denver. The duo dishes up sophisticated, international snacks. Next time, you have a client meeting—or mid-day date—in Denver, head to Winston and Hume’s weekday, lunch-time only stand for specials like a corn crabcake sandwich on a sesame roll—or everyday options such as grilled lamb gyros or spicy chicken and kimchi tacos. The price is right ($3-$7)—and this is a great example of the Luxury Re-valued Culinary Shift. 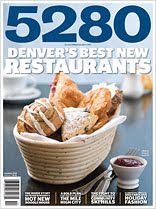 5280’s Best New Restaurants Issue is on Newsstands. Buy One. Start Eating. While the menu of this airy Highland bistro changes with the season, you can find a few key dishes on it year round. Thank goodness, because its rillettes—a buttery, slow-cooked meat spread—are not only the perfect complement to toast, but they are also a great expression of the rustic, peasant foods movement. Rillettes, like other charcuterie (pate, prosciutto), are a classic form of meat conservation. The gastropub trend finally hit Denver with this LoHi eatery. The restaurant offers beers like New Belgium’s tiny batch-brew, Lips of Faith, and bottles of Belgium beers to go along with its hearty appetizers (bacon caramel corn, roasted bone marrow) and dishes (herb-crusted lamb). Jammed into this busy and boisterous restaurant, you might feel like you’re on a street corner in Asia, slurping up a bowl of noodles. The truth, though, is that Bones is much more than a hurried Asian noodle bar. Using local produce and products, the restaurants elevates the Asian fast food into a flavorful, layered dish. The second venture of Duo’s owners and chefs, Olivea focuses on Spanish cuisine (with a touch of southern French and Italian flavors). Try chef John Bronning’s classic Spanish flavors like oven roasted potatoes (patatas bravas) with alioi or his grilled octopus with fennel. If you’ve seen Shifts, you’ve heard Cathryn and me talk about Salt’s pre-prohibition cocktails. Time to go try them. After-school snacks. Grandma’s cooking. So go the comparisons to Hutch & Spoon’s eats. The tiny, breakfast/lunch spot near downtown Denver serves up dishes like a meatloaf sandwich with melted cheddar or grilled cheese with peach chutney. Be sure to order a homemade soda (watermelon-lemonade, cucumber) to accompany it. This French-inspired shop focuses on one thing: sandwiches. Try the tortilla española (a Spanish potatoe omelet on a baguette) or the tangy braised pork shoulder. Order the amante picante (a blend of tequila, cilantro, cucumber, jalapeño, and lime), and then the kona kampachi appetizer (topped with candy Pop Rocks) at this sleek Larimer Square spot, and you’ll quickly realize that ingredients don’t need to play by the books to please. *For more information on any of these restaurants, pick up the December issue of 5280. Fill a cocktail shaker with ice. Add the gin, liqueur, lemon juice, and orange juice (or orange bitters) and shake vigorously. Strain into a chilled cocktail glass and garnish with a sugared cranberry. *To make sugared cranberries, blanch fresh cranberries in boiling water for one minute, then roll them in granulated sugar. Pour Alpine herbal liqueur into an ice-filled, lo-ball glass and top with cider. Be sure to go out to eat this week!! 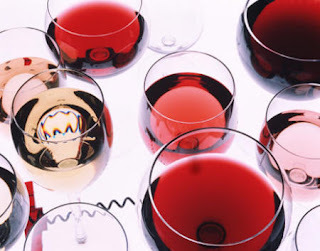 For this week only, over 40 of Boulder's top restaurants will offer a special three course $26 prix fixe dinner menu. Here is the list of restaurants with the specialty menus.